Thanks to the weather-resistant and waterproof PE rattan, the lounge set is easy to clean and is hard-wearing and suitable for daily use. The seat features a sturdy, powder-coated steel frame and aluminum base. It is also lightweight, making it easy to move around. The modular rattan lounge is very flexible and can be easily moved around to suit any setting! Note: 1) We recommend covering the set in the rain, snow and frost. 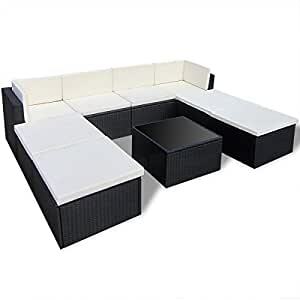 1 x coffee table with black glass top, 2 x corner seating, 2 x seating without armrests, 4 x stool, 8 x seat cushions, and 6 x back cushions.